The Poet Laureate plays a crucial role in keeping the arts accessible and vital to all age groups, and acts as a statewide emissary for poetry and creativity. 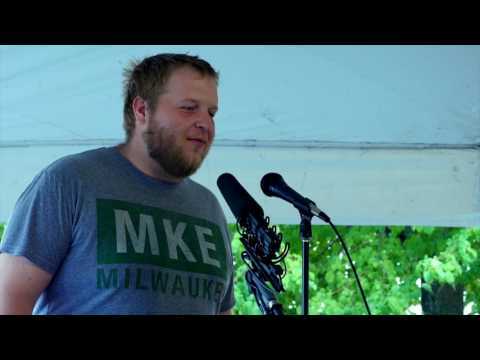 Peter Burzynski of Milwaukee, WI recites "Finis," by Orlando White. Sara Ceballos recites "The Red Wheelbarrow" by William Carlos Williams. Danny Ceballos recites "Untitled" by Lorine Niedecker. Victoria Konnova recites "The Giraffe" by Nikolay Gumilyov. Linda Kroll recites "Fern Hill" by Dylan Thomas. Meredith Mason recites "Bedtime Story" by Charles Wright. Lynn Kuhns recites "Death of a Naturalist" by Seamus Heaney. Janet Wullner-Faiss recites "The Laughing Thrush" by W. S. Merwin. Jesse Elmer recites "Jamaican Song" by James Berry. Sherry Elmer recites "God's Grandeur" by Gerard Manley Hopkins. Kimberly Blaeser recites "Eagle Poem" by Joy Harjo. Andrew McSorley recites "Mt. Pisgah" by James Kimbrell. Art Malcom recites "The Boxer" by Paul Simon. Sarah Gilbert recites "Lake Isle of Innisfree" by WB Yeats. Nathan Reid recites "Pancakes" by Anis Mojani. Claire Hoy recites "Shiloh" by Herman Melville. Emily Bowles recites "I Never Saw a Moor" by Emily Dickinson. Kathryn Gahl recites "House of the Rising" by Samantha Thornhill. Melissa Range recites "The Last Quatrain of the Ballad of Emmett Till" by Gwendolyn Brooks. Austin Segrest recites "Poem" by Elizabeth Bishop. Catheryn Cofell recites "The Thing Is" by Ellen Bass. Lucy Rose John recites "Plato Told" by e.e. cummings. Kimberly Blaeser recites "Apprenticed to Justice." Alessandra Simmons recites "Pied Beauty" by Gerard Manley Hopkins. Shannae Aurora Martinez recites "Frente al Balance, Manana" by Otto Rene Castillo. Sam Pekarske recites "We Real Cool" by Gwendolyn Brooks. Ed Makowski recites James Wright's "Lying in a Hammock at William Duffy’s Farm in Pine Island, Minnesota." Margaret Rozga recites "One Art" by Elizabeth Bishop. Tobias Wray recites "I Dwell In The Possibility" by Emily Dickinson & "Blessing The Boats" by Lucille Clifton. Franklin K R Cline recites "The Trees" by Philip Larkin. Chuck Stebelton recites William Blake's "The Echoing Green" and Rod Smith's "We Work Too Hard..."
Kimberly Blaeser recites a translation of "A Great Wagaon" by Rumi. Bruce Dethlefsen recites "Remember" by Christina Rossetti & "The Last Rose of Summer" by Thomas Moore. Phillip Kassner recites Matt Cook and more. Destinny Fletcher recites "American History" by Micheal S. Harper. Soham Patel recites from "Shadow Mountain" by Claire Kageyama-Ramakrishnan. Margaret Hesse recites "The Loveliest of Trees" by A.E. Housman. Lewy Olfson recites "Parting," by Emily Dickinson. Dorothy Kent recites "Another Intimation for Amy" by Kimberly Blaeser. Sylvia Kavanaugh recites "Communion," by Louise Erdrich. Carrie McGhee recites "An Evening Song," by Joy Harjo. Peter Burzynski recites "Finis," by Orlando White. Amber Wardzala recites "Living History" by Kimberly Blaeser. Liam Callanan recites "How to Write a Poem about the Sky" by Leslie Marmon Silko. Peggy Rozga recites "What Is a Poem?" by Simon Ortiz. Shanae Aurora Martínez recites "Today Was a Bad Day like TB," by Chrystos. 2015-2016 WI Poet Laureate, Kimberly Blaeser, recites "Eagle Poem," by Joy Harjo. Megan DeMeuse recites "Lady Lazarus" by Sylvia Plath. Jill Stuckenberg recites "Run for the Roses" by C. D. Wright. K.Y. Chan recites a Classical Chinese Poem. Sarah Cowan recites Sonnet 130 by William Shakespeare. Maddie Kane recites "[i carry my heart with me(i carry it in]" by e.e. cummings. Nuzhat Baladi recites a Classical Poem in the Sindhi Language. Charles S. recites "Vengeance" by Walter Wheatly. Randy Jefferson recites "Someone" by Dennis O'Driscoll. Bill Quist recites "Sitting Alone at Sunrise: Problems in the Space-time Continuum" by Miller Williams. William Stobb recites "Meditation at Lagunitas" by Robert Hass. Adam Halbur recites "Heart" by Shinkichi Takahashi. Madeline McNichols recites "Sonnet 123" by William Shakespeare. Margaret Rozga recites "I'm Nobody! Who Are You?" by Emily Dickinson. Wendy Vardaman recites "Blessing the Boats" by Lucille Clifton. b: william bearhart recites "Scheherazade" by Richard Siken. Sarah Sadie Busse recites "The Armadillo" by Elizabeth Bishop. JoAnn Chang recites "The Walrus and the Carpenter" by Lewis Carrol. Chuck Stebelton recites "A Round of English" by Lew Welch. Brenda Cárdenas recites "from 'Body in Flames'" by Francisco X. Alarcon. Lindsay Daigle recites an excerpt from "Florida" by Lorine Niedecker. This program was supported in part by a grant from the Wisconsin Arts Board with funds from the State of Wisconsin and the National Endowment for the Arts.